Authorities found out and took the embalmed corpses away. She is having a mausoleum built on her property to get them back. 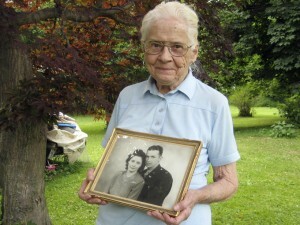 A quick update on the July story about 91-year-old Jean Stevens in Pennsylvania. Stevens, many people will recall, had been keeping the embalmed bodies of both her husband and twin sister in her home. Pennsylvania officials quickly determined that this was not an appropriate form of final disposition for the bodies and took them away. I wrote about the original case here. Back in July I suggested that Pennsylvania authorities should think twice about prosecuting Stevens and, instead, help her build a mausoleum for the bodies. The 91-year-old widow [Jean Stevens] who lived with the embalmed corpses of her husband and twin sister — until authorities found out and took them away — is hopeful they’ll be returned soon. Workmen at Stevens’ rural property outside the northern Pennsylvania town of Wyalusing have been busy the past few months, erecting a gabled building with gray siding and a white door. It resembles an oversized shed, or a smaller version of Stevens’ detached garage. In reality, it’s a mausoleum that Stevens intends as the final resting place of her husband of nearly 60 years, James Stevens, and her twin, June Stevens. And authorities have told her it’s the only way she can get them back. So there you go. Jean Stevens will be re-united with her dead husband and sister, forevermore. All the usual Aaaah! responses, and very happy aaaahs, too. In the UK I think she could have had her way and kept them at home (so long as no danger to public health). I like to think so. They do things more genteelly in the US. Never been a fan of genteel. Why did the twin have the same last name as Jean and her husband?